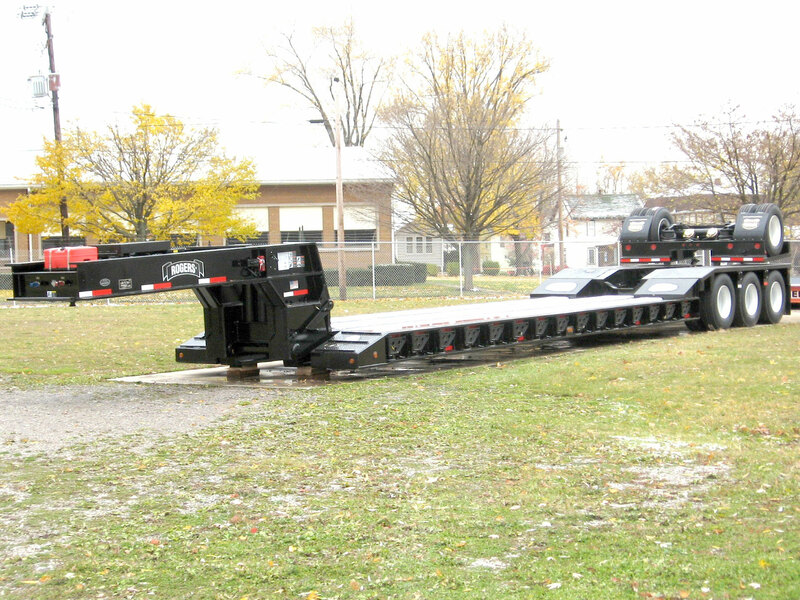 This high performance 100-ton ROGERS trailer has a detachable ground-engaging ram foot gooseneck, a detachable rear frame, and a "flipped" removable 4th axle. The steel-covered front slope of the deck has grouser bars for traction. Removable steel bridge ramps aid in loading equipment over the rear frame. The gooseneck has a self-contained 18 HP gas engine with an independent gas tank (red container) and a tire carrier located on top (pictured without a tire). The three fixed axles have spring/walking beam suspensions, and the removable 4th axle has air ride suspension. Other specifications include: a LED light package, a mechincal backup alarm (on middle fixed axle) and steel wheel covers made of reinforced 1/4" tread plate. The severe-duty removable side brackets can swing out to hold additional oak planks and widen the deck by a foot on each side, or for a total width of 12'-0".